Antique Code Show How bereft the coin-op arcades of yesteryear must have looked before the arrival of the audacious, muscle-flexing Out Run machine. 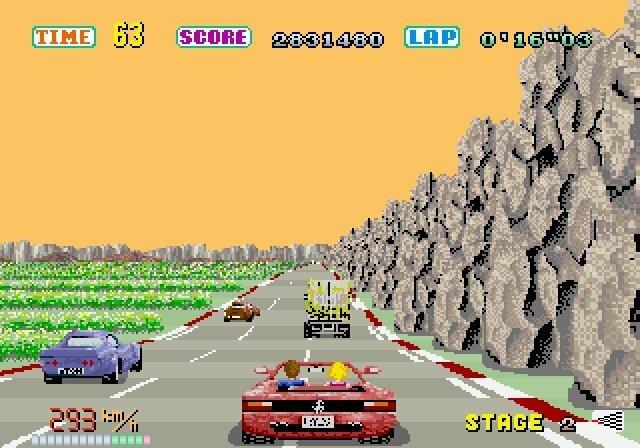 It’s true that Hang On and Space Harrier laid the foundations a year before, but Out Run was Sega’s golden moment in sit-down, "experience" videogame machinery. There were two versions of the deluxe, non-upright cabinet, with the flashier one containing a 26-inch screen (whoa!) and luxury seat. Both contained heavy-duty motorised elements so that the plastic beasts could move and shake to simulate your car’s racing manoeuvres. 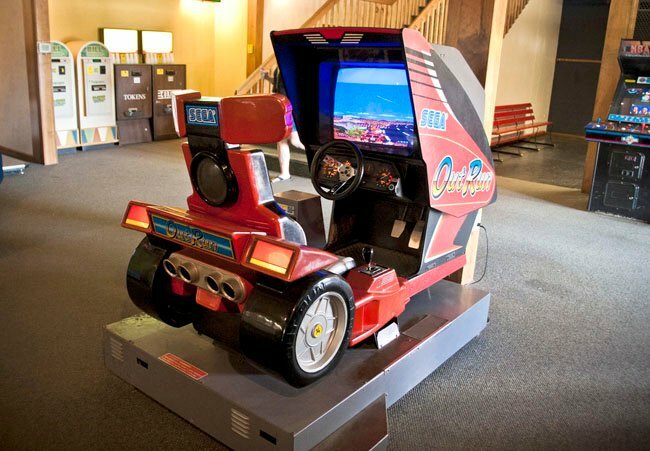 Adults and children were duly lured to the steering wheel of the Ferrari Testarossa-like car – Sega hadn’t gained the licence at this point. 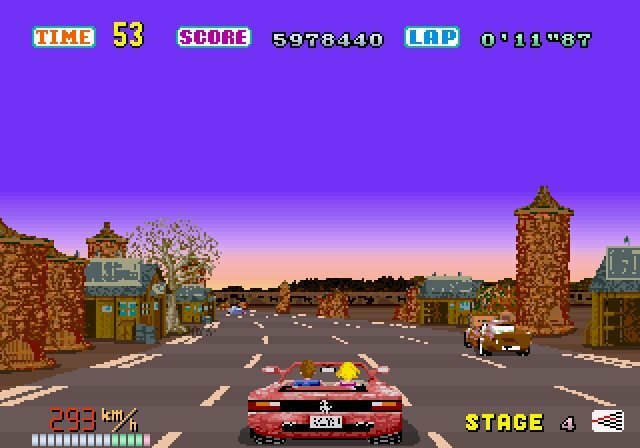 With the on-screen passenger seat filled by a provocatively dressed lady – who issues a good telling-off each time you crash – the game provided a heady fantasy for young and old alike. No doubt there are still a few machines lurking in smoky old seaside haunts, more than 25 years on. 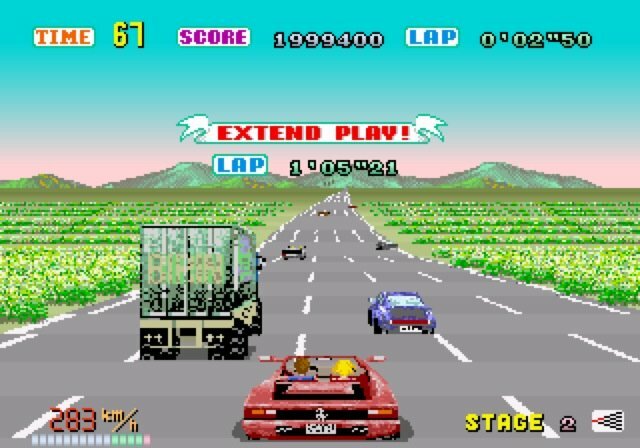 Sega’s closely guarded "super scaler" code routines were employed to create the smooth moving, undulating roads and scenery. Unlike the standardized "System 16" hardware that would power Sega’s bread-and-butter arcade titles for the rest of the 1980s, Out Run’s hardware was custom designed, featuring two 68000 processors, both running at an impressively zippy 12.5MHz. Hardware scaling took care of the vehicles and roadside scenery – of which there was an inordinate amount – on one layer. The road was made of tiled bitmaps on a separate layer, again scaled directly by the hardware, no less impressively. 128 sprites could be displayed simultaneously, shunted around at the breakneck speed needed to simulate driving a vehicle at almost 300 kilometres per hour. Yu Suzuki, probably Sega’s most infamous games producer – he would go on to create titles such as the Virtua Fighter and Shenmue series – was keen to bring realistic driving mechanics into video games. 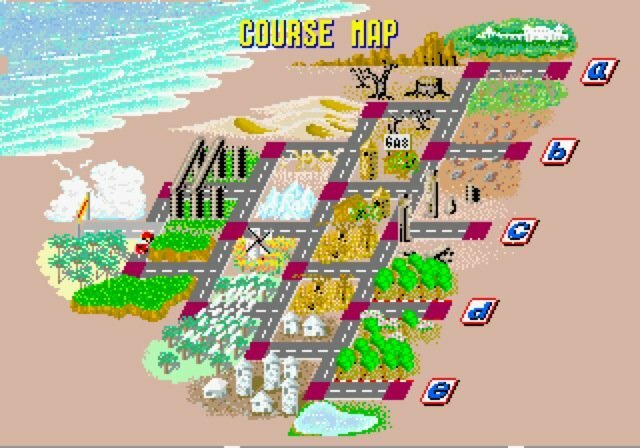 “I wanted to make a driving game where people who were skilful drivers of cars could also achieve good results in the game,” he later said. And so Out Run machines came complete with up/down gear shifters that needed to be used at just the right point for optimum acceleration, an analogue steering wheel and accelerator pedal, and a car that handled differently at higher and lower speeds. A distant forerunner of Gran Turismo? Absolutely. Originally inspired by the film Cannonball Run, Suzuki found American landscapes too vast and empty for his country-wide race game. Sega’s R&D budget sent him on a handy European road trip that gave him the inspiration he needed for his roads and scenery, taking in Swiss mountain passes and Italian cities, allegedly with a video camera strapped to the rental car. All for that vital need to understand Ferrari’s homegrown territory, of course. The Romanesque stone arches of the second stage – after taking the left turning – are especially memorable, with the illusion of speed enhanced significantly by those tunnel-like sprites. As many boy-racers found out, the hypnosis induced by the twisting, repetitive scenery was also very good at sending your vehicle off road and into a spin. Suzuki appreciated that sound needed to make a significant contribution to the overall experience so he decked Out Run cabinets out with chunky speakers right next to a player’s lugholes. High-quality digitised voices and vehicle noise samples were pumped out by the same sound chip that had been used in the Space Harrier chip, a 4MHz Yamaha 2151. 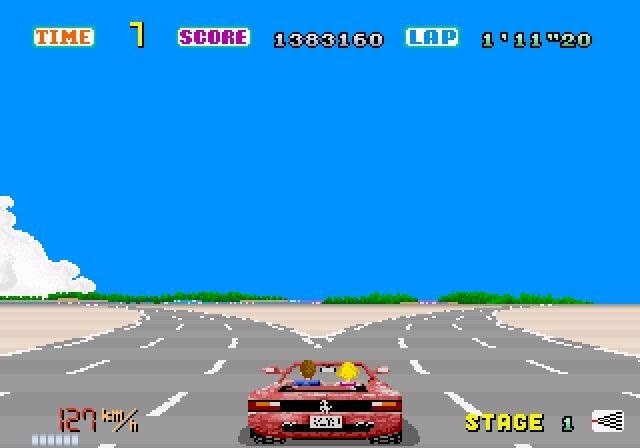 Many years before Grand Theft Auto started dabbling with the idea, Out run allowed the player to change the car radio to one of three bands at the start of play. The Magical Sound Shower, Passing Breeze and Splash Wave backing tracks are the stuff of folklore to Out Run fans, with original and reworked versions cropping up in the remakes and spin-offs that have appeared over the years. Inevitably, the home computer and console conversions became top-sellers on the back of the arcade game’s success. Quality was variable, and it’s a mark of the original title’s graphical standards that it took the Sega Saturn release in 1996 – ten years after the debut of the original – for a fully realized, arcade-perfect conversion to finally do justice.